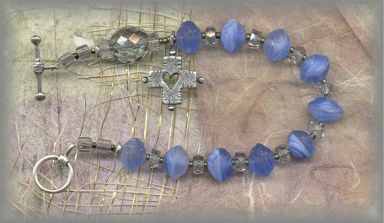 CHAPLET BRACELETS: A recent surge in interest in the chaplet, especially the one decade (10 bead) chaplet, has brought with it the chaplet bracelet. The prayers are the same as the rosary only this is simply one fifth of it - 5 times around and you have said a mystery of the rosary. Available in a wonderful selection of antique beads, pearls, silver beads and semi precious stones. Add a little cross or medal of your choice for a reminder. I never take mine off so its never forgotten! METAL PARTS: All crosses, crucifixes and religious medals and closures are hand cast from antiques and vintage pieces in sterling silver and solid bronze then antiqued to restore original patina. The Rosary Workshop is the sole retail distributor on the internet for these hand-cast parts. 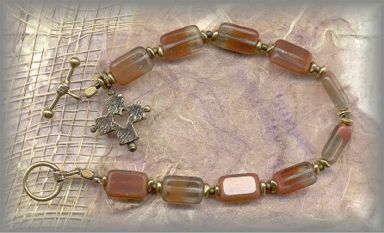 BE SURE TO VISIT OUR MAIN SITE (rosaryworkshop.com) to see the ROSARY MUSEUM, HISTORY OF THE ROSARY (Journaling the Bead), PRAYERS, SERVICES (how to make a rosary) and many other interesting things. To return to the cart, simply click on TO ORDER on any product in MUSEUM STORE.